Mix the correct ingredients to serve the customer’s favorite smoothie. After a long day at school, most kids earn their fair share of having fun. This can be in the form of outdoor play or a short session with their favorite iPad apps. And, the best kinds of games to blow some steam off are the short mini games that you can play for a few minutes, then replay on the next day. Unfortunately, most mini games for kids are not designed to be replayed over and over again, especially not over the span of days and even weeks. That’s why I think my app pick for today is quite unique. Called Arthur’s Big App, this new PBS Kids app aims to fill in this gap with four fun mini games that you can play for many hours. There are four mini games that you can play along with Arthur and his friends. The app will select a game at random for you to play. Each time you complete a game, you will get a star. If you manage to collect five stars, you can unlock a character from the TV series. 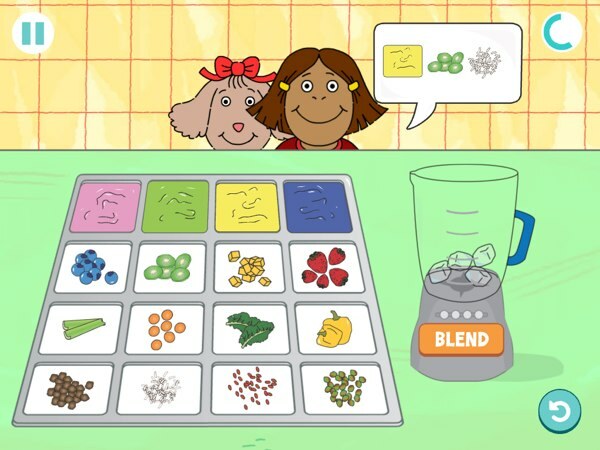 One of the games that you can play is making smoothies at the Sugar Bowl. Several characters will line up, each with his or her own favorite smoothie mixes. Drag two or more ingredients into the blender and push the button. Your job is to serve them the correct mix before the time runs out. Next, there is a tag game where you try to freeze the character that’s holding a specific flag with. The goal is to freeze all characters that belong to the same group. If you’re not fast enough, the frozen characters may wake up and move again. And if you tap the wrong character, all the frozen characters will wake up. You can also play the role of a librarian by swiping the color-coded books from and into the shelves. On one side, there will be characters requesting a book from one category, and on the other side a stack of returned books that you need to put on the shelves. Your job is to finish both tasks before the time runs out. The last one is a piano-based rhythm game. Using a four-note mini piano, you are asked to play a variety of tunes including popular nursery rhymes and the theme song from the TV series. Your job is to play the song as flawlessly as possible. Even though the gameplay is quite intuitive for kids ages 5+ to play on their own, they are quite challenging. The difficulty level increases as you unlock more characters, proving that you’re progressing through the game. For example, you may be required to play up to 85 musical notes correctly, create up to 10 smoothies mix, swap up to 25 books in the library, or play the freeze-tag game with teams of six people. In total, there are 50 characters that you can unlock. I’d suggest you challenge your kids to unlock one character a day. It’s quite challenging, but not overly time consuming. Play the role of a librarian to match color-coded books with the returned books and the new requests. The games are simple and intuitive. The only one that I believe requires a bit of explanation is the librarian role play. All the other games can be played even without the narrated instructions. When you have unlocked ten or more levels, the games can become quite challenging. Even simple games like smoothie mix or librarian role play require you to focus in order to finish the task within the time limit. I haven’t played up to the final levels, but I can sense the increasing difficulty levels. In the librarian role play, you can give a returned book to the new loaner as long as the color matches. It’s a shortcut that lets you save one swipe. With this approach, you don’t need to return the book to the shelves first. In the piano rhythm game, you need to use all four fingers of your right hand, or two fingers of each, to play the songs with a faster tempo. The challenges that require you to play 70+ notes correctly are too difficult to play with three or less fingers. Tap the characters with the correct flag colors to freeze them. Be careful not to tap the incorrect characters. Arthur’s Big App is a collection of four mini games developed based on the popular TV series. The games are intuitive and fun for kids ages five and up, and the later levels are even challenging for older kids. With up to 50 characters to unlock, this app will have fill many, many afternoons.